Do you want the healthy back posture of a kneeling chair but are concerned about the restricted leg movement and pressure on your knees? Could posChair 1 be your answer? These chairs stop the pelvis slumping backwards by tilting the seat forwards. The angle is so steep that knee rests are needed to stop you sliding off, or bracing your legs to stop yourself sliding. They are not there for any other reason. They do give good posture for the spine. Unfortunately this is often achieved at the expense of your knees and legs. 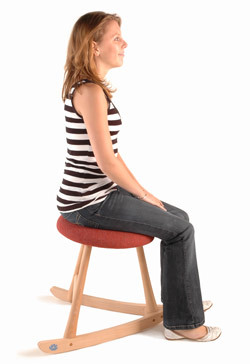 As well as putting pressure on your knees, even the rocking kneeling stools fix your legs in one position with no movement of the knee joint. As we become more sedentary we are becoming more aware of the problems caused by immobility. Doctors now recommend more movement and exercise for back pain, deep vein thrombosis, as well as other conditions. posChair 1's rocker radii are carefully chosen to stimulate and use your natural balancing reflexes. This means the seat does not have to slope as steeply to give you the same healthy back posture, so it does not need knee rests to stop you sliding. Most users choose to sit still most of the time, but even then there are imperceptible movements keeping your spine, legs and joints mobile. (There is one situation where we do recommend you consider a kneeling chair: if you simply have to work at a surface that is quite a bit too high for you. Some of the kneelers, especially the adjustable ones, can give you a higher sitting position than other chairs, but if at all possible it is better to get your work surface down to the right height for you). We discussed chairs with hundreds of people, when we used to exhibit at shows. We did meet some people who loved their kneeling chair. However the majority who have tried them said the fixed position and pressure on the knees is restrictive and uncomfortable after a time. 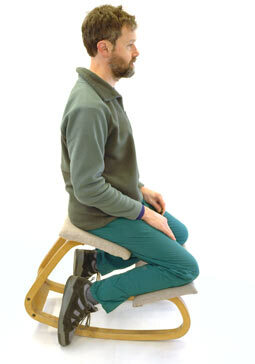 They said they prefer the Wave Stool's freedom and more natural posture.